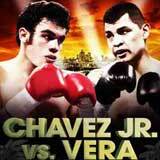 Review: 2013-09-28, very close fight between Julio Cesar Chavez Jr and Brian Vera: it gets three stars. Brian Vera ranked as the No.12 middleweight in the world, entered the fight with a record of 23-6-0 (14 knockouts) while Julio Cesar Chavez Jr had a record of 46-1-1 (32 knockouts – Chavez Jr is not ranked as he hasn’t fought since September 15, 2012 when he was defeated by Sergio ‘Maravilla’ Martinez). Chavez Jr vs Vera had been signed at the super middleweight limit of 168 pounds but this week the weight was increased to 173 pounds because Chavez had some problems making 168; moreover the fight has been reduced from a scheduled 12-round bout to a 10-round and Vera got extra money for changing the weight (approximate $400,000).. Watch the video!